With Easter quickly approaching I thought it would be fun to talk a bit about Easter traditions. New ones and old ones. When I look back on when I was a child I think Easter was one of my favorite holidays. I mean, we get tons of candy from a fluffy bunny that we can never seem to get a glimpse of. So much fun to be had! I remember trying to find that bunny. Every time I would see a bunny in my grandmas yard she would say that it is the Easter bunny and then I would get all excited and run outside to chase it down. Easter is always filled with such fun traditions for families. Some of the usual traditions are dying Easter eggs. I haven't been able to do this with my own children yet but I am looking forward to it and dreading it all at once. It will be fun to see all the different creations they can come up with, but I am sure there will be plenty of messes to clean up afterwards. I saw in Walmart the other day chalkboard Easter eggs. 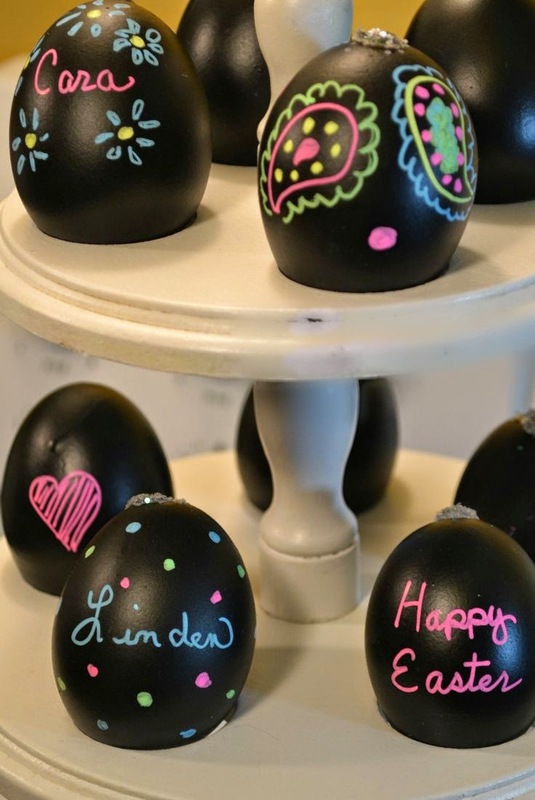 I thought these were such a smart idea in the aspect of keeping it clean and tiding when it comes to decorating eggs. But I also thought that the eggs would be lacking in bright happy Easter colors. So I guess I'm a little torn on this idea but I will probably give them a try someday. You can buy these at Walmart or make them yourself with real egg shells. The best part of Easter was finding your Easter basket. I loved looking for my basket and would get so excited thinking about all the yummy candy that would be inside of it. I remember looking and looking to only come across one that had one of my siblings name on it. Bummer! Keep looking! Oh the joy of finding the one with my name on it! Today there are so many options for an Easter basket for your children. You can buy one that is pre-stocked with all kinds of goodies or buy a simple basket and stock it yourself. I think something that would be fun is making your own basket from scratch. Here is a cute idea that I am wanting to try sometime next week. 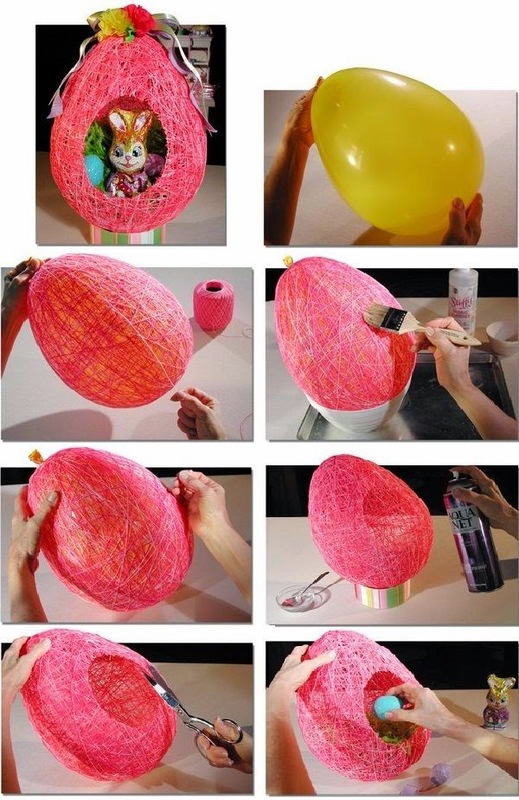 I creates such a cute look for Easter and seems fairly easy and inexpensive to make. I love this idea because you can totally make it your own. You can pick out the colors and all the pretty decor to put on it. I will give this one a try! When I was young I remember a tradition my family had that we would do every Easter. After we got done searching for Easter eggs and baskets we would set out to find our Disney movie. My parents got our family a new Disney movie every Easter and hid it so we would have to find it. It was a fun tradition and it was always something I looked forward to. We then could watch our new movie and stuff our faces with chocolate eggs and jelly beans. That might be one tradition I carry on with my kids. What sort of Easter traditions do you remember from your childhood? Do you do those same traditions with your family today? Please leave comments! My family still to this day decorates the eggs then later we'll make deviled egg sandwiches with them. Yum!